The steady rhythm of drums. The smell of sage. The sense of community. You’ve arrived at a Native American powwow. 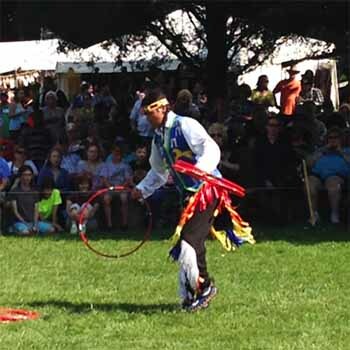 The powwow program at NLM is entering its fifteenth year this month. NLM staff travel up and down the East Coast from New York to North Carolina to about a dozen powwows per year between April and September.The word “powwow” means spiritual leader, and these events usually focus on native dancing, crafts, and food such as “Indian tacos,” which use fried bread as the shell. NLM exhibits at powwows to interact with the community and demonstrate how to use and access NLM’s free resources. Some major health problems facing American Indians and Alaska Natives are diabetes, being overweight, and obesity. Each of these health concerns is related to lifestyle, and part of the mission of the powwow program is to share resources and information to live a healthier lifestyle. With every powwow that NLM attends, we set up a booth for community members to talk about their health concerns and for NLM to share resources and information that may help them lead a healthier lifestyle. Many times people have been diagnosed and are looking for information on how to live with diabetes or how to be a caregiver for someone with cancer, for example. The NLM has many free databases and NIH MedlinePlus magazine that can help. 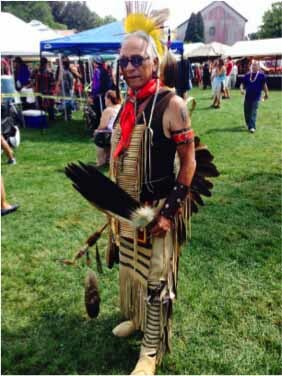 Powwows build community pride for the native tribes. Members bring their handmade jewelry, clothing, and accessories to sell, but the center of the action is a steady stream of dancers who flow in and out of a circle to the heavy drumbeat. Each dance highlights different techniques. One of the most popular dances is the “fancy dance,” a style created by the Ponca tribe in the 1920s in an attempt to preserve their culture and religion. Each powwow also has a dance that honors those who have fought for our country by inviting veterans to enter the dance circle. Native Americans are the original storytellers, preserving culture through tradition, stories, and dance from generation to generation. NLM is proud to be a part of these gatherings. 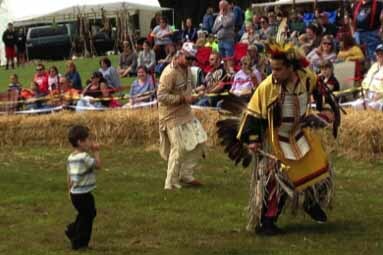 A Native dancer shows a child how it’s done at the Roasting Ears of Corn Festival, Allentown, PA, August 2015. October 27, 2016 in Programs & Services.